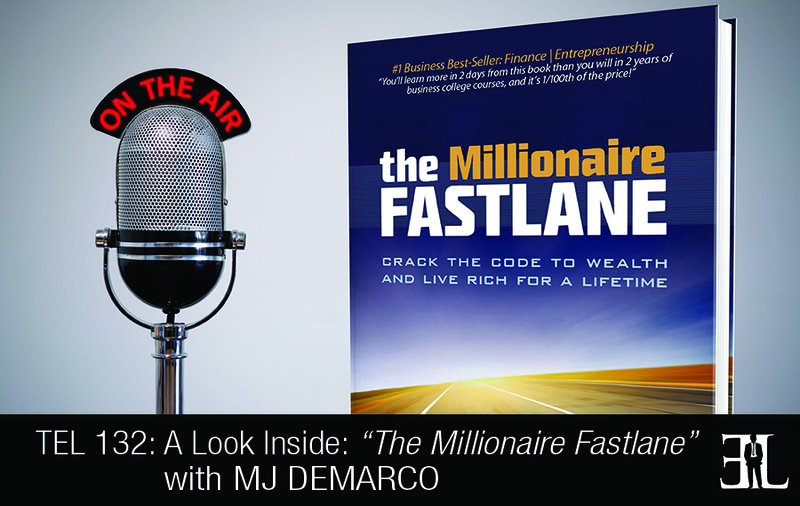 In this episode MJ DeMarco reveals all his insights on his book, The Millionaire Fastlane, where he cracks the code to becoming wealthy and living the rich life. In his book DeMarco provides you with an expressway to extraordinary wealth that will get you to financial freedom faster than any other guide out there. The goal of his book is to teach you why most entrepreneurs fail, the leading cause of being poor, why typical jobs will never make you rich, how the rich really get rich, and why the guru myth of “do what you love” will most likely keep you poor, not rich. This book is perfect for entrepreneurs who are ready to leave the job market to pursue self-employment in order to gain financial freedom, be their own boss, and ultimately become very rich. I think a lot of authors focus on one particular concept and that concept may be valid for 6 months or a couple of years and they’ll talk about this one concept the entire book. My book contains the entire roadmap. I’m not going to write a book unless I feel it can change somebodies life. I am trying to paint a whole picture to where when someone puts it down they actually feel something has changed and they feel their odds of succeeding in entrepreneurship have doubled, tripled or quadrupled. Be value driven to the masses. The phrase I use in my book is if you want to make millions you need to start impacting millions and do it with value. The book is sliced into three different phases and those three phases are what I call the road maps to wealth, the sidewalk roadmap, the slow lane roadmap, and the fast lane roadmap. The front half of the book covers the sidewalk and the slow lane and these two roadmaps are more about what you shouldn’t be doing verses what you should be doing. This half covers why these strategies don’t work and it goes in depth with the mathematics behind it. I would say that 80% of the country falls into the mindset of the sidewalk roadmap which is a paycheck to paycheck mindset. It’s a consumer mindset where everything you earn goes to buying something and you don’t really save money. The interesting thing about the sidewalk roadmap is it doesn’t matter what you make and the common denominator there is what you earn is what you spend. The slow lane mindset is what I call a frugal mindset. And this mindset is all about saving and trusting that the stock market will someday make you rich. In the end you’re trading time and pieces of your life in hopes to be free later. The back half of the book goes into the leverage entrepreneurship aspect. Leverage entrepreneurship is best handled when it covers five main commandments which are your need, entry, control, scale, and time. It is the ability to get into a business that is product centered. I started an internet company way back in the late 90’s. I founded it with about 900 bucks, no internet training, no computer science degree and I was able to sell it a couple years later during the internet boom. The company that bought the company folded and I was able to get it back at a fire sale price. I helped the company for another 6 to 7 years until I sold it again in 2007. During this time that I owned the company I was able to cash flow it six figures monthly profit and sold it to a multimillion dollar valuation. After selling the business in 2007 I went on a little semi-retirement hiatus and one of my goals was to write a book about all the trials and tribulations of entrepreneurship which was The Millionaire Fastlane. I was leading a fantastic life of abundant wealth and when I reflected upon that it was all due to entrepreneurship and The Millionaire Fastlane is how to bring about that type of scenario.